Phifertex outdoor fabrics now with microban. Strudy and functional yet built for comfort. Rich in texture, design and color. Phifertex outdoor fabrics offer everything you could wish for in a sling furniture fabric. And it gets better. Now, Phifertex is infused with Microban antimicrobial protection for an extra layer of cleanliness protection so you can fuss less over your outdoor furniture. Added during the manufacturing process, Microban product protection helps prevent the growth of stain and odor causing bacteria, mold and mildew that can damage the product. We know outdoor furniture is ofter exposed to the elements. No need to worry - Microban protectionwill not wash off or wear awayfor the lifetime of the product. Plus, take comfort in knowing that Phifertex fabrics are built to withstand the elements and are durable and wildew and fade-resistant. Phifertex fabrics are brawny and the built-in microban protection works continuously to keep Phifertex cleaner for longer, but regular care is recommended to help maintain the appearance of the fabric and ensure its extended life. 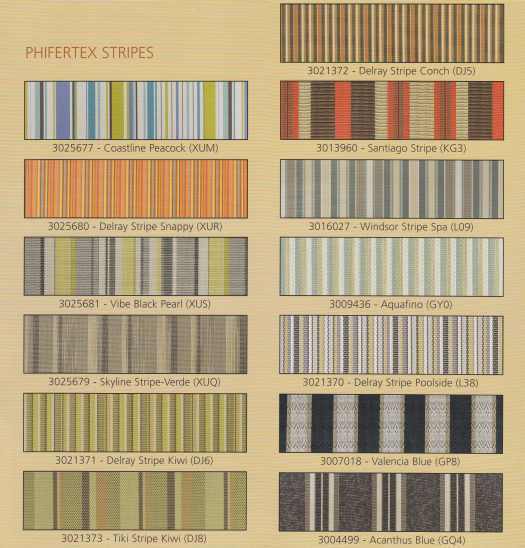 PhiferTex Stripes is a Special Order Item. Please call for availability.